On February 9, 2018, I attended a public hearing in Portland, during which the Oregon Fish and Wildlife Commission (OFWC) voted to approve a petition to uplist the Marbled Murrelet from Threat-ened to Endangered under the Oregon Endangered Species Act (OESA). The petition was brought forth by the Portland Audubon Society and four other conservation groups. It was a dramatic end to a long day. The morning was filled with presentations about the Marbled Murrelet, including an update about the research being conducted by Oregon State University (OSU). Public testimony took place in the af-ternoon, followed by deliberation among the commissioners. The room was packed with supporters, and most of the nearly 40 people who testified spoke in support of the uplisting. Even so, things looked grim by late afternoon. Commissioner Bruce Buckmaster made a motion to deny the up-listing but to create Survival Guidelines for the species. The motion was seconded, and a vote was called: three yays; three nays. More debate followed. Commissioners Greg Wolley, Laura Anderson, and Holly Akenson stood firm in support of the uplisting. After a long pause, Commissioner Buckmaster said he would rather vote for the uplisting than leave the room without “doing something to help the murrelet.” This left an opening for Commissioner Wolley to make a new motion, this time to approve the petition for uplisting. The motion was se-conded, and the Commission approved it by a vote of 4 to 2. I think it’s fair to say that almost everyone in that room was shocked, but happily so. If you have a moment, consider emailing the Commission at odfw.commission@state.or.us and thank them for doing the right thing. I was proud to represent RVAS and provide public testimony, and grateful for the opportunity to meet some of the people who have devoted hundreds of hours to this effort. Several of them will likely be heading our way in the fall, as we host the annual conservation meeting. The uplisting should result in some much-needed protections on state-owned lands. The rest of this column will focus on the current status of the Marbled Murrelet and the implications of the uplisting. The Marbled Murrelet (Brachyramphus mar-moratus) is a small seabird that breeds along the Pacific Coast from Alaska to central Califor-nia. The Marbled Murrelet spends most of its life at sea, where it forages for small fish and inver-tebrates, but nests in large trees with thick mossy branches—a specialized strategy that limits it to patches of old-growth coastal forest. Much of the habitat that remains is highly frag-mented, and Murrelet eggs and chicks are more vulnerable to predation from ravens and jays at these forest edges. Climate change is worsen-ing wildfires, which can damage habitat whether it’s protected or not, and warming seas, oil spills, and algae blooms impact both the Mar-bled Murrelet and the forage fish upon which it feeds. Marbled Murrelets are federally listed as threatened under the U.S. Endangered Species Act and threatened under the Canadian Species at Risk Act. And now they are state-listed as endangered in Oregon, Washington, and California. Loss and degradation of the Marbled Murrelet’s nesting habitat sparked the federal and state list-ings. Though the implementation of the Northwest Forest Plan has slowed down the rate of habitat loss on federal lands, that has not been the case on state lands here in Oregon. 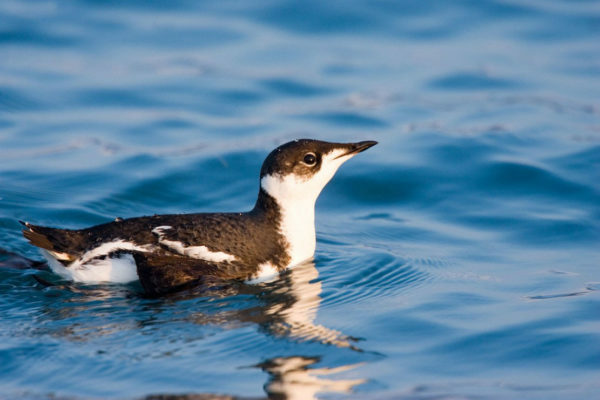 The status report on the Marbled Murrelet—a document prepared by the OFWC ahead of the hearing—estimates that over 21% of “higher-suitability habitat” was lost on non-federal lands between 1993 and 2012. To justify the uplisting, the Commission had to determine that the “likelihood of survival of the species has diminished such that the species is in danger of extinction throughout any significant portion of its range within Oregon.” The status report includes some pretty grim figures about the Marbled Murrelet’s “extinction probability” in Oregon. Demographic mod-els estimate that the probability of extinction is over 80% by 2060 for Conservation Zone 4 (the Siskiyou Coast Range) and over 80% by 2100 for Conservation Zone 3 (the Oregon Coast Range). The OFWC must immediately develop these guidelines, which will serve as interim protec-tion until the relevant state agencies develop their plans. The Commission will also work with “state land owning and managing agencies” (including ODF) to determine if state lands can play a role in the conservation of the species. In the meantime, OSU researchers will continue their efforts. Some of their goals include better understanding the many factors which determine whether the Marbled Murrelet suc-cessfully breeds in a given year. In practical terms, the research involves tagging up to 100 birds at sea, then following them (using a combination of radio telemetry and unmanned drones) to see where they go and what they do. The project includes opportunities for citizen scientists to participate in Marbled Murrelet surveys. Theses two-day sessions will take place on Oregon’s central coast (near Yachats) on July 13-14 and July 19-20. Training is included. To RSVP visit: http://audubonportland.org/issues/species/murrelet/survey.